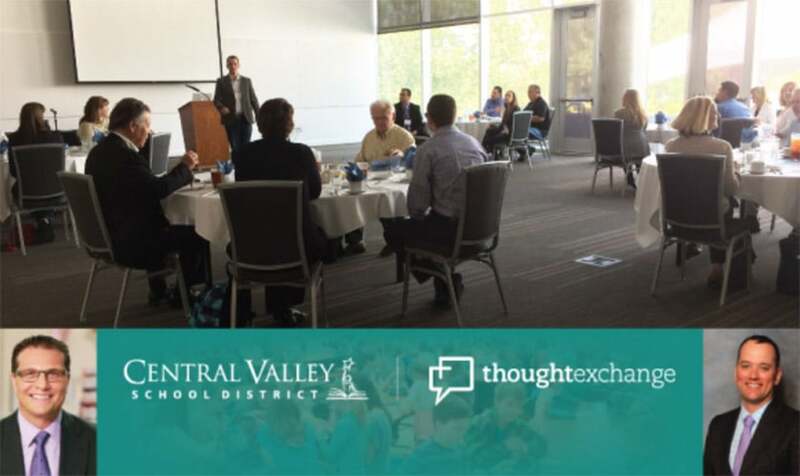 In May Thoughtexchange co-hosted an event in Spokane, Washington called Creating Shared Understanding in School Communities – How online engagement helped Central Valley School District pass its first bond in 17 years. And, as it turns out, that very commitment to ongoing community engagement was a fundamental reason for Central Valley’s success. As we’ve explored in this space earlier, Districts use Thoughtexchange, among other things, to help manage crises, to create and promote a culture of change, and generally to build trust in the administration through listening. In the financing context, it is critical to avoid having “engagement” with the community begin and end with asking for money and defending the district’s reason for doing so. CVSD Superintendent Ben Small emphasized that Thoughtexchange was not a ‘bond passing tool’, and using it for that sole purpose might not only be ineffective, but could actually damage a District’s efforts to build a relationship with the community. Following Ben’s presentation, Dave provided further background on Thoughtexchange and allowed the group to dig deeper into the process, software, and the power of using an online community engagement platform. Dave once again led the group in an exercise in which everyone could ask questions. After another five rounds of sharing, shuffling and scoring, questions were clarified and stories were shared. In the end, the group developed an understanding of how Thoughtexchange might work in their own communities. The Spokane event was sponsored by Lydig Construction, as part of its ongoing commitment to community accountability, a cornerstone of Lydig’s corporate philosophy.